“So how’s what’s-his-name?” my brother asked. Even through the phone he sounded distracted. “What’s-his-name? You mean my significant other?” I asked. “No, no. Not Crabby. The little one — you know, uh…. Oh, the Mexican hairless!” he finally spat out in exasperation. It’s usually a bad idea to take a big swig of liquid while talking to my brother. Some of the iced tea ended up on my shirt, and some ended up across the room. 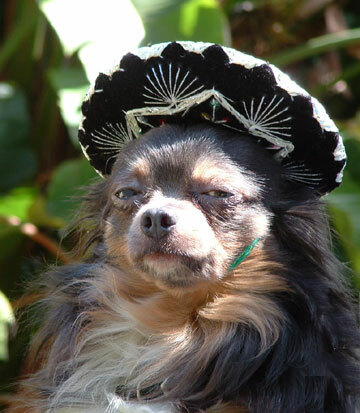 “Did you just say ‘Mexican hairless’?” I couldn’t suppress a chuckle. Dog raised his head from the couch, his ears standing at attention and displeasure in his eyes. “It’s an antiquated term for Chihuahua,” I told him. “You’re not helping your argument,” I told him. He curled one side of his upper lip so just the tip of one fang showed. The sudden image of a pack of tiny canine guerillas clad in bandoliers and serapes flashed before my mind’s eye. 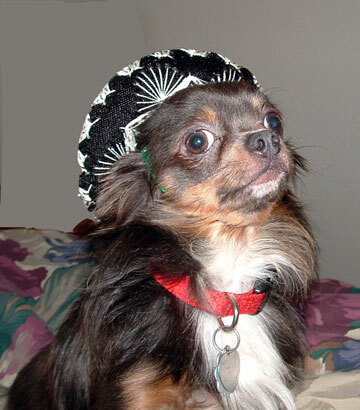 “Chihuahua-Americans,” he pronounced succinctly, slipping in a sneeze at the end. “I shouldn’t have to make deals in order to loose the unjust shackles of society’s oppression,” he said, laying his ears flat against his neck and gazing up at me with big, sad Chihuahua-American eyes. “You do that because you love me,” he responded, climbing into my lap and licking my wrist. “Even when it’s time for a bath?” he asked, turning his head so I could scratch behind the other ear.